‘Morning Came and Morning Went’ is the title of a new book by my friend, Fr James (Jim) Mulligan. Jim comes from the same townland as myself, a townland called Moneyvriece, a mile outside the quiet little village of Ederney in north Fermanagh. It is a townland with history and geography, ancient monuments and fond memories for both of us. It is in that townland that my grandparents who came from Drumquin settled in the early 1900’s. It is where my father was born and reared. It was populated by both Protestants and Catholics and we got on fairly well. Jim and I went to the same primary school, Moneyvriece PS, the same chapel known as St Joseph’s in Moneyvriece (aka Blackbog) and we went together to St Michael’s College in Enniskillen. Jim was always different. He always dressed smartly and walked along at a leisurely pace greeting people with a smile and a word or two. Jim was never in a hurry. He was always observing. He was one of five boys of Edward (Ned) Mulligan and Brigid Dolan. They lived in a long lane beside Ginns farmhouse and opposite our house a few fields away. We sometimes played together as children. Jim was always a deep thinker and more into books than outdoor or physical sports. He was considered delicate after some kind of illness in his young days. He obviously loved being out and about exploring the rivers and streams in our townland and the neighbouring townlands of Edenaveigh and Clonee. Jim has an amazing memory for people and places and incidents -some even involving my own father that I cannot recall. He remembers all the other ‘characers’ from my own childhood days-Ned Kelly, Johnny Beacom and Hugh Rushe. Jim left St Michael’s to train as a teacher. He stayed in Queens university for a few years and then left. He went from there to England where he studied to be a teacher. He taught in many schools in many different countries. He loved travelling. He always had a great knowledge of music and art and was an authority on Bob Dylan. He had eclectic tastes in music and books. He remained a teacher in London until he was near the age for retiring. He got the urge or the call to become a priest and after consulting Cardinal Murphy-O’Connor joined the archdiocese of Westminster. He studied at the English College in Rome and by all accounts enjoyed every minute of his time there. I attended his ordination in London along with a large contingent from Ederney and a number of former pupils from St Michael’s, Enniskilllen. It was a great and unexpected reunion at that stage in our lives. Jim was in great form that day. All his family were there and we had a barbecue in the sunshine next door to the church. The next I heard of Jim, he was working in parish in London and very much taken with Medgegorie. This surprised me because I thought of Jim as being a liberal like myself who would not have a great deal of time for the esoteric. Anyway, I got a bigger surprise when I received a large book in the post entitled Medgegorie and the author was none other than Fr Jim Mulligan. The next I heard from him is when I received his new book in the post -without any accompanying letter. I only have had time to glimpse through it and read some of the stories -and very good and funny they are. He has stories about my father and the neighbours like Patrick John Monaghan of the shop and Hugh Rushe, the whistle player who lived with his wife, Annie, in a colourfully decorated house at the end of Jim’s lane. My grandfather and grandmother lived on the same lane. The Mulligans and the McVeighs lived ‘ar scath a cheile’ (in each other’s shadow), as they say in Irish. In the book, Jim recalls the fellas from his time in St Michael’s who went off to be priests. Jim says he got a surprise when he heard thatI I was going to study for the priesthood. I have to say that I too got a big surprise when I heard Jim at age of sixty had decided to be a priest. Life is strange and truth is stranger than fiction which you will discover when you read this terrific book. 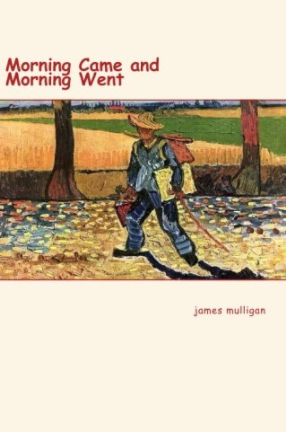 Just one story from this interesting collection: Jim recalls that at some stage Granny Dolan came to live in their house. Granny Dolan was very religious. The Rosary had to be said every night. And after the Rosary there was ‘ the trimmings’. One night he recalls when the Rosary was finished and they were saying the additional prayers for various people and various intentions. Granny Dolan prayed for the Pope, and Cardinal Mindsentzy in Hungary and persecuted priests and nuns and Johnny Ginn. The boys(there were five of them) all started laughed and Granny looked up and asked why they were laughing. One of the boys, Eddie said: “But Granny, Johnny Ginn’s a Protestant. We don’t pray for Protestants!” Granny Dolan replied sharply, “Why not? Johnny Ginn (who lived across the fields) needs prayers like anyone else.” A real insight into life in the north in the innocent 1950s. It is a great book even though he does his best to embarrass me in it. Many of the other characters mentioned are dead. I think you are sure to enjoy this book even if you never heard of Moneyvriece!.